One of the things that we love about this breakfast recipe is how easy, foolproof and quick it is to make. Not to mention it’s the superfood marriage of matcha and chia seeds. It just takes minutes to make and doesn’t require any serious cooking or fancy kitchen equipment—not even hot water. So, it’s 10% effort, 90% benefits. How often does that happen? *Chia seeds are an excellent source of omega-3 fatty acids, which help HDL cholesterol. Don’t be fooled by their size: the tiny seeds pack a powerful nutritional punch. High in protein, rich in fiber. Chia seeds are also relatively easy to find in most grocery stores. They can be sprinkled in yogurt, cereal or smoothies. They can also be added to baked goods. We love the versatility! Toppings: fresh fruits, seeds, nuts, dates, granola, etc. In a bowl, glass jar or cup, combine and mix the chia seeds, flax seeds, Matcha powder or Collagen powder together. Then, add the Almond-Coconut milk and honey. Stir and mix very well, making sure that the chia seeds and matcha powder are not sticking together. Place in the refrigerator overnight. This will allow the chia seeds to expand and create a creamy texture. The following morning, give the chia seeds a good stir again. Top and garnish with seasonal fruits, nuts, etc. 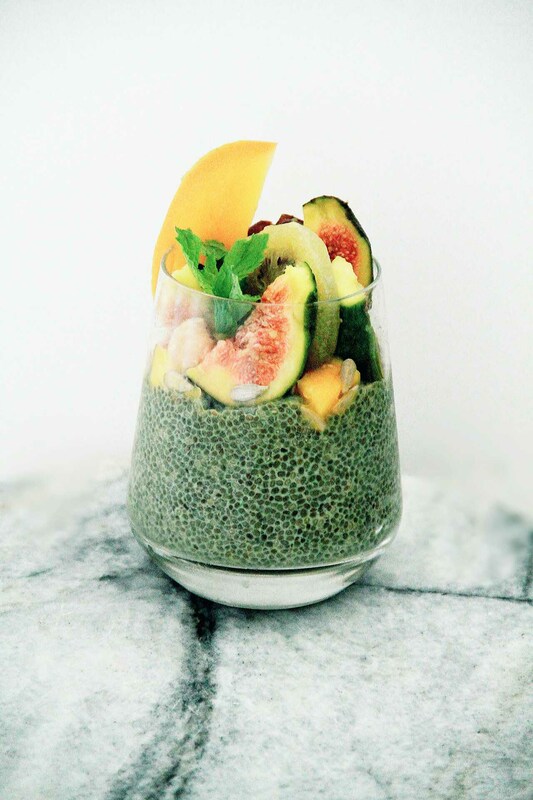 Chia pudding can be stored in a covered container in the refrigerator for up to 2-3 days. For a thicker texture, you can add more chia seeds, as desired. If Matcha powder is unavailable in your city, you replace it with cocoa powder and/or cinnamon to the Almond Milk. Be creative! For Matcha, there are several grades and subgrades of Matcha that we’ve come across. We recommend using a high quality premium culinary grade Matcha (preferably originating from Nishio city or Uji city in Japan, the top producers of matcha). While the color may not be vibrant electric green like ceremonial grade (highest grade), it is still very bright in color. Lower grade matcha will have a stronger bitter taste and yields a yellow-olive-brownish color, that’s coarse in texture. If you do make this, share and tag your photo with #yvetteteas on Instagram.